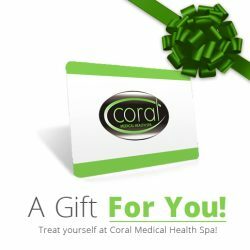 At Coral Medical Health Spa, we specialize in a number of Medical Cosmetic Treatments including Cosmetic Hyaluronic Dermal Fillers by Juvederm and TEOSYAL, Intense Pulse Light Hair Removal, Intense Pulse Light Photorejuvenation by Palomar Medical, and BOTOX Cosmetic®. BOTOX Cosmetic® has hit the mainstream market in recent years and has grown tremendously in Coral’s Medical Cosmetic Practice. Dr. Zoia Sherman M.D, a board certified Anti-Aging Specialist, has been treating fine lines and wrinkles with BOTOX Cosmetic® for many years with great success! A consultation is recommended before proceeding with treatment. BOTOX Cosmetic® is an approved, safe prescription drug which is used to reduce or minimize facial wrinkles in the area(s) it is applied. The treatment involves very tiny injections into the muscles under the skin in order to temporarily relax the muscles. This will prevent the muscles from fully contracting, and thus will minimize wrinkling typically associated with negative expressions such as: worry, anger, stressed appearance. BOTOX works to stop the information transfer that occurs between your brain and your muscles. It does this by blocking the release of acetylcholine, which is the substance that transmits information, and, as a result, the muscle doesn’t receive the message to contract. This means the muscle spasms stop or are greatly reduced after a BOTOX treatment, providing predictable and reliable relief from symptoms. The BOTOX is injected directly into the muscle. Your doctor will determine the muscle(s) in need of treatment. Most patients report minor and temporary discomfort from the injections. A very fine needle is used to inject the muscle in one or more places. BOTOX is neither acid nor alkaline which helps minimize pain on injection. When does BOTOX start to work? Usually you will see the effects of BOTOX within the first two weeks of injection. The relief you will feel from BOTOX will normally last for three to four months. Over time you will notice a gradual fading of its effects. At this time you may want to return to the clinic for the next treatment. How long can I be treated with BOTOX? Since BOTOX has been around for 15+ years worldwide, long-term treatment with BOTOX is quite likely. The safety profile in long-term treatment has been well established. Please ask our Doctor if BOTOX is the right treatment for you. BOTOX should not be used during pregnancy, if you are nursing, or if you are taking certain medications. Only a Physician can determine the best course of therapy. What side effects may be experienced when using BOTOX? Side effects caused by BOTOX are usually minimal and temporary. This usually depends on the location of the muscle being injected. Some people notice temporary weakness of muscles, or discomfort at the injection site. Most side effects are also transient in nature, and BOTOX is generally well-tolerated by patients. Please direct any questions you may have directly to the Doctor. Pricing ranges from $75.00 and up, depending on the number of units needed, and the area being treated. The Soft Lift is a new treatment that combines the benefits of Botox Cosmetic and Juvederm dermal filler to address multiple signs of aging at the same time for an overall refreshed look that’s subtle and natural looking. Soft Lift smoothes deep wrinkles and fine lines, restores lost fullness and enhances facial contours – all in just one treatment session. The overall effect is a balanced, refreshed look that’s totally you. Getting started is simple. You can schedule a consultation by contacting us.